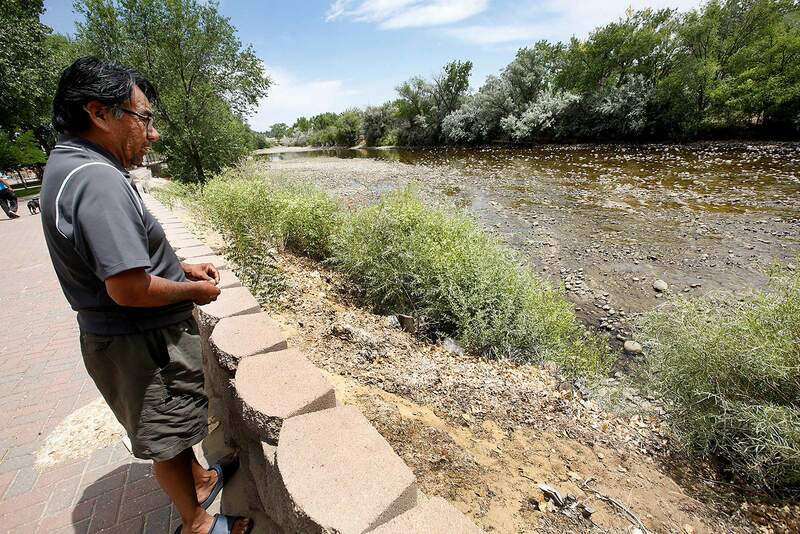 Sammy Joe of Shiprock stops Thursday in Boyd Park to check out the Animas River, which had only 1 or 2 inches of water flowing through rocks near the confluence with the San Juan River in Farmington. Editor’s note: After this story published, the U.S. Geological Survey said it erroneously reported the Animas River flowing at 0 cubic feet per second this week in Farmington. The river was actually measured at 5 cubic feet per second – still near historic lows. The Animas River has all but dried up in Farmington. According to a U.S. Geological Survey gauge in Farmington, the Animas River hit 0 cubic feet per second this week and has remained at near flat-line levels ever since. Cubic feet per second – or “cfs” – is the way river flow is measured. While the gauging station may be recording 0 cfs, there is some water in channels away from the gauge, said Greg Smith, a senior hydrologist for the Colorado River Basin Forecast Center. “It’s not absolutely 0, but it’s awfully close, and probably not going to improve until we start seeing rainfall in the area,” Smith said. 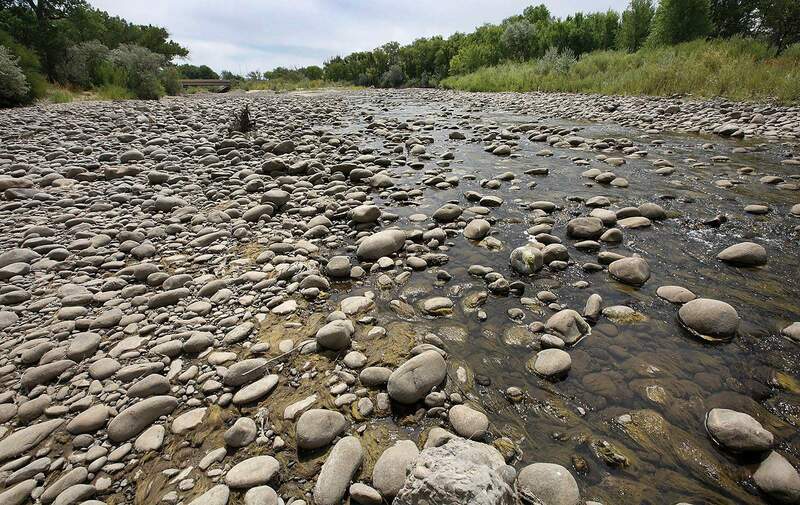 The sight of the Animas River barely reaching its confluence with the San Juan River is just another display of this year’s unprecedented drought, which is on track to be the second driest year in 120 years of recorded history. It all started this winter with a dreadful snowpack. In the San Juan Mountains, the peak of the snowpack was only half of what the region usually receives based on more than 100 years of records. The Animas River is mostly dry in Farmington, near the confluence with the San Juan River. A river gauge measured 0 cubic feet per second on the river in Farmington, the lowest on record. Extreme drought persisted into spring and summer. Since Jan. 1, a weather station at the Durango-La Plata County Airport has received only 2.25 inches of rain, nearly 4 inches below the historic average. And then, abnormally high temperatures caused what little snowpack was in the San Juans to melt early. The Animas River saw its third lowest peak flow in recorded history, and one of its earliest, hitting a high of about 1,000 cfs in May. The Animas River usually peaks at about 4,700 cfs in early June. For the most part, the city of Durango has gotten by through the low water year without having to implement water restrictions. Jarrod Biggs, the city of Durango’s assistant utilities director, said the city’s reservoir is at full capacity after having to pump out of the Animas River in May, about a month ahead of schedule. The city of Durango gets most of its water from the Florida River, supplementing with water out of the Animas when necessary. The city is now on an operating schedule, drawing 2 million to 3 million gallons of water out of the Animas every other day. Downstream is a different story. Restrictions in New MexicoAs a result of drought conditions, the city of Farmington enacted mandatory water restrictions, and the town of Aztec requested its residents take voluntary measures to reduce water use. “I’ve seen the Animas go dry before, but it’s usually been (in September or October),” said Jeff Smaka, who’s worked for Farmington’s public works department for 29 years. The city of Farmington was set to enact stricter Stage 3 water shortage measures on July 16, which would have added surcharges to residents who used more than 6,000 gallons of water. But residents have been conserving water as part of the Stage 2 restrictions in place, closing in on a nearly 15 percent reduction in water use, Smaka said. As a result, the city has delayed enacting Stage 3 restrictions. “We’ve asked people to conserve water, and they’re doing it,” he said. Calls to the town of Aztec were not returned. A diminishing flowMonitoring the Animas River water gauges up and down the watershed tell part of the story of why water is so low in New Mexico. 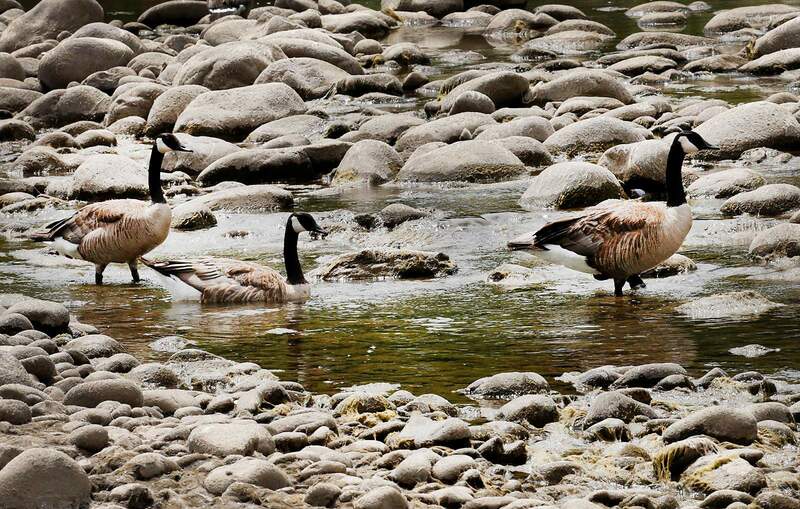 Geese have a hard time Tuesday finding pools of water deep enough to swim on the Animas River in Farmington. The region is in an “exceptional drought,” the most serious listing by the U.S. Drought Monitor. But just 10 miles farther downstream in Aztec, the Animas River quickly drops off, recording 11 cfs on Thursday. Then about 15 more miles downstream in Farmington, the river all but zeros out. The Colorado River Basin Forecast Center’s Smith said in that stretch, there is a lot of people pulling from the river, whether for municipal use for Aztec and Farmington or irrigators with water rights. And, there are a lot of unmeasured diversions out of the river. In normal water years, these pull-offs go unnoticed. But in dry years, Smith said it’s highly apparent. “When you see a lot of irrigation, it doesn’t take much pull from the river to make a big difference when it’s so low,” he said. Lake NighthorseRuss Howard, manager of the Animas-La Plata Operations and Maintenance Association, which manages Lake Nighthorse, was out of the office this week. Susan Behery, a hydrologic engineer for the Bureau of Reclamation, said Lake Nighthorse pumped water only in May. Even at its height, only about 92 cfs was being pulled into Lake Nighthorse. The Animas River flowed at just 20 percent of average for the month of June, Behery said. At the USGS’s Farmington gauge, the Animas River is usually flowing at 1,520 cfs this time of year. The previous lowest flow was 3.3 cfs recorded in 2002 – the region’s lowest water year on record – also known for the Missionary Ridge Fire. This article has been updated to correct the name of Jarrod Biggs, Durango’s assistant utilities director.